Our team here at Natura Consulting works hard to help preserve Queensland’s precious ecosystems. We are contracted by a number of organisations to help minimise environmental impacts. Recently this has seen us travel to the wild west of the state with intentions of protecting native vegetation. The Southern Brigalow Belt, which is one of Queensland’s 13 bio-regions, covers around 22 million ha of land between the towns of Emerald in central-north Queensland and Goondiwindi in the central-south. The bio-region has undergone habitat clearance on a massive scale. Since the 1940’s we have lost more than 90% of unique Brigalow vegetation (woodland, forest and vine thickets) 1, 2, representing a loss of 10 million ha of native vegetation up until 20043. These special environments are home to some of our most endangered animals including the Bridled Nail-tail Wallby (Onychogalea fraenata), Black-breasted Button-quail (Turnix melanogaster) Ornamental Snake (Denisonia maculata) and Ooline (Cadellia pentastylis). Sadly we have already lost two charismatic species forever from this remarkable environment, the Paradise Parrot (Psephotus pulcherrimus) and Darling Downs Hopping-mouse (Notomys mordax). Our recent work alongside PowerLink™ is helping to minimise unnecessary damage to what remains of this bio-region’s habitats. The company has been commissioned to develop a system of power lines across the Surat Basin between Roma and Wandoan and North to Euromba to help improve the region’s electrical infrastructure. Natura Consulting’s role in this has been to map and identify invasive and endangered, vulnerable and threatened plant species in the area. Why is this important you may ask? Well, firstly invasive plants, or weeds, are a big problem in central and western Queensland. These plants are not native to this bioregion (many originating from Europe, Africa and South America) and can outcompete native plant species and fodder crops as well as poison cattle. This impacts on both the natural environment as well as the livelihood of local farmers. Considering that a majority of the Brigalow’s human population rely on farming as their primary income, any threat to their subsistence is vital to address. PowerLink™ has a duty to map these weeds because during the construction of power lines, they use many of the area’s farm access roads and therefore may assist in the dispersal of weed seed on vehicles and clothing. Our mapping therefore provides the company with the ability to pinpoint hotspots of weed invasions and take necessary action to contain and/or remove them. Secondly, we also map endangered plants in order to ensure that the new powerlines do not cause them damage or affect their surrounding habitat. 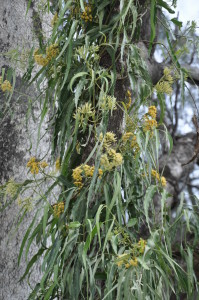 Much of the Brigalow Belt’s flora is threatened to varying degrees and so it is important for all organisations to minimise their impact. Our latest trips in April and June 2014 were a great success. Using GPS point markers and the ID skills of two intrepid Natura botanists, we marked over 400 problem weed sites over nearly 2,000km of access roads. We were surprised that many of these weeds were not environmental weeds, in other words, weeds that are a national threat to the Australian environment and economy. However, there was a strong presence of African Love Grass (Eragrostic curvula), Johnson Grass (Sorghum halepense), Mimosa Bush (Vachellia farnesiana) and Noogoora Burr (Xanthium pungens) which have now all be documented. We were also pleased to find that there were few endangered plant species within the powerline easement area with only a handful of Narrow-leaved Bottle Trees (Brachychiton rupestris) and Kurrajongs (Brachychiton populneus) needing to be mapped and spared. Luckily our nearest nationally endangered plants were spotted far to the north of the construction area near the town of Taroom. 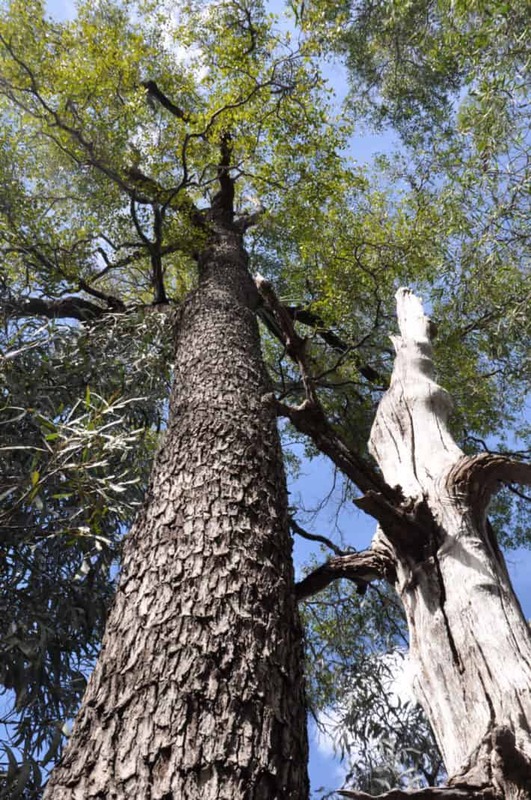 These were tall and elegant Ooline (Cadellia pentastylis) trees which are listed as Vulnerable in Queensland under the Nature Conservation Act 1992 (NCA) and nationally under the Environmental Protection and Biodiversity Conservation Act 1999 (EPBC Act) and are, apart from anything else, breathtakingly beautiful. Their tall stout trunks are scattered with tessellated flakes of bark, each curled up at either end. The canopy bears a lush bounty of dark olive green foliage that is starkly different to the surrounding dry leaves of the Poplar Box (Eucalyptus populnea) and Brigalow (Acacia harpophylla) woodland. The leaves are small, resembling those of Beech trees and from October till December the whole tree is shrouded in dainty peach-coloured flowers. 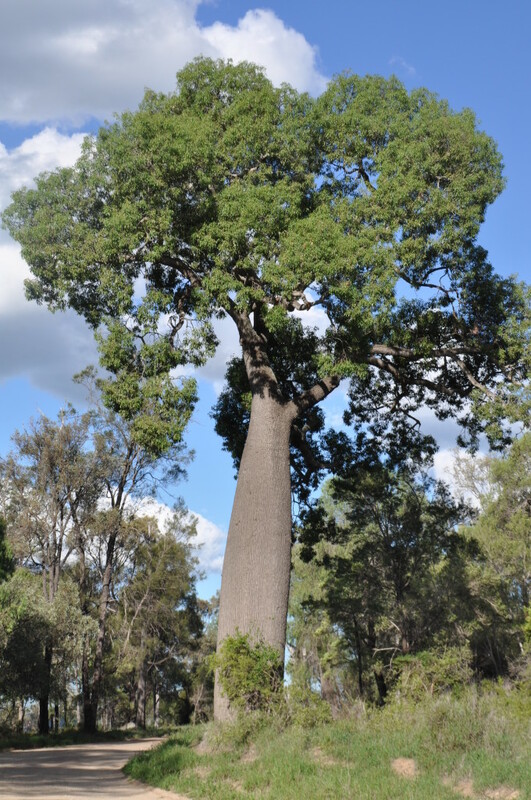 The tree is special because it is a member of a strange family of trees unique to Australia and South America that has likely evolved in these regions following the break-up of Gondwana. We were very pleased to see these trees were protected in roadside reserves and were well away from any development. All in all, we hope that the future construction in the area will follow a similar level of respect for the environment as has been shown by PowerLink. With sustainability and habitat destruction ever key and pressing words in day-to-day life, we happily continue our work with PowerLink in the knowledge that they are doing their best to protect and promote flora and fauna in this remarkable bioregion whilst also providing better services to its human inhabitants. Sattler, P. S. and Williams, R. D., (1999) The conservation status of Queensland’s Bioregional Ecosystems. Environmental Protection Agency and Queensland National Parks Association, Brisbane, Australia. Moore, A. W., Russel, J. S. and Coaldrake, J. E., (1966) Dry matter and nutrient content of a subtropical semiarid forest of Acacia harpohllya Muell. (Brigalow). Australian Journal of Botany 15,11-24. Seabrook, L., McAlpine, C. and Fensham, R., (2006) Cattle, crops and clearing: Regional drivers of landscape change in the Brigalow Belt, Queensland, Australia, 1840-2004. Landscape and Urban Planning 78,373-385.